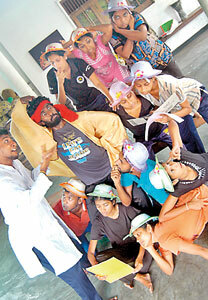 ‘Socrates’, a theatre production was staged this month by the Fine Arts Department of the University of Peradeniya. The play was originally written and staged in 1994 by Dr. Sunanda Mahendra, and was adapted with permission this time by Pujitha De Mel, a visiting lecturer at the University of Peradeniya. De Mel, who was responsible for the writing, production and direction of plays such as Asinamala (2001) which was awarded the titles of Best Director, Best Script and Best Music among others at the National Drama Festival, is no stranger to theatrical productions. Apart from the previous, he has also been involved extensively in forum theatre. “It’s a drama within a drama scenario,” he says. “We also worked with size-specific theatre here.” For example, the play was staged in the Professor Ediriweera Sarachchandra Open Air Theatre at the Peradeniya University (more popularly known as the ‘wala’, a hotspot for productions at the university). De Mel and his students used the inversely symmetrical dimensions of the arena (it is a built into a cavity in the grounds) to its best advantage. The audience was seated on the traditional stage whilst the play took place on the steps around the arena that the audience usually uses. He adds that true versatility in any actor will allow them to adapt to whatever environment they perform in. “For example if we take this play to Colombo we might not get to stage it in such an arena. Then we’ll have to quickly adapt into the area we’re given.” When it comes to a skilled actor, location shouldn’t be an obstacle, De Mel points out. The Fine Arts Department of the Peradeniya University was established in 2001 and is very focussed on experimentatal theatre, says De Mel. Students in the department are remarkably committed to perfection, he smiles. “For example, we were in Colombo training for about 12 days straight. From about 5am to 10 o’ clock in the night our students were rehearsing and training, especially for the play.” The cast and crew would like to give special mention and thanks to Athula Samarakoon, Department Head of Fine Arts at the University of Peradeniya and Dr. Sunanda Mahendra who voluntarily offered the script for the students to stage.